"...the beating heart of a truly complete audio system." Derrick Moss is a driven guy. The design mind behind the Aurum Acoustics Integris CDP/Active 300B audio system as well as the company's head of sales, marketing and R&D, Derrick seemed destined for all of these roles, given his engineering degree and MBA. Derrick has been especially busy for much of this year, and he has no one to blame but himself. 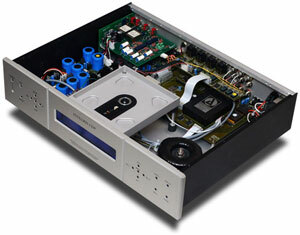 The Integris CDP, Derrick's integrated CD player and preamp, has been upgraded to improve its sonics. In addition, there is a pair of new add-on modules that increase the CDP's already-rich feature set. The Integris CDP's base price has increased to $13,500 USD, with a fully accessorized unit going for $16,800. But what you get for your money is substantial -- the beating heart of a truly complete audio system. The Integris CDP's optional headphone amplifier ($1000) and phono stage ($2500) occupy a pair of circuit boards that can be added to the Integris CDP at the time of purchase or afterwards. The headphone amp is suitable for use with 'phones 16 ohms or greater in impedance, and its 7-volt output will drive even the most insensitive headphones. The circuit board gets its power from the CDP's internal transformer -- Derrick thoughtfully included extra power connections in the initial design -- and can be turned off completely via a back-panel switch. Volume control and input switching are handled by the Integris CDP's front-panel controls or the unit's Logitech Harmony programmable remote control. The new phono stage is quite a bit more complex, as its ample switching indicates. It uses active devices in two separate gain stages along with step-up transformers. The first stage provides 31dB of gain and the second an additional 12dB, with the option to boost the gain by another 6 or 12dB. A stereo pair of Lundahl transformers is engaged for low-output moving-coil cartridges, providing 20 or 26dB of gain beyond the second stage. Thus, the Integris CDP's phono stage can accommodate moving-magnet and moving-coil cartridges of essentially any output, due to a circuit that provides from 43 to a whopping 81dB of gain. Loading is similarly wide-ranging: from 47k to 50 ohms, with two choices for each combination of settings. Given the price of the phono stage and the Integris CDP itself, it is far more likely that buyers will own a luxe low-output moving-coil cartridge than a less expensive moving-magnet, so Derrick optimized the phono stage for the former. With a low-output moving-coil cartridge, according to Derrick, "The circuit behaves as though its shorted and its very quiet -- what noise is there is mostly just the standing noise of the cartridge's coils just hanging there and acting microphonically." Few phono stages are as flexible and listener-friendly as the Integris CDP's, including the many standalone units available. Gain and loading are both adjustable via back-panel switches, allowing easy tailoring to just about any phono cartridge. There are no jumpers to engage or resistors to change. Input is via RCA jacks, which disable one set of the Integris CDP's RCA line-level inputs. While developing the headphone amp and phono stage, Derrick also devised ways to improve the sound of the Integris CDP's CD playback and preamplifier section. These occurred in the digital-to-analog-conversion section, the preamplifier output circuits, and at the analog inputs. Derrick also boosted the power-supply voltage by 20%, so the maximum output level is now more than 10V (20V balanced). These circuit changes are "the jewel in the crown," as Derrick calls them. "The phono and headphone sections are quite interesting as well, but the core improvement is what most satisfies me. Better yet, it truly surprised me." Finally, an upgrade that's non-electrical. Derrick now supplies some stainless-steel cones with the CDP along with Inovaudio Counterpoints. You thread the front two cones tightly into the inserts for the Integris CDP's stock rubber feet: "Screwing them on tight must make the vibrations couple more readily between the chassis and the spikes." You then place the third cone, which is supplied without a threaded insert, in the middle-rear of the CDP: "We theorize that it may work best if one is left looser." The Counterpoints are nicely made three-piece aluminum-Corian-plywood receptacles for the spikes. They act as sinks for vibration and certainly protect whatever is beneath the ultra-pointy spikes. As I've mentioned, the headphone amp and phono section can be added to existing Integris CDPs. The same is true for the circuit upgrades and spiked footers; contact Aurum Acoustics for pricing. However, while the spikes and Counterpoints are user installable, for the circuit upgrades, headphone amp and phono stage, users have the choice of returning certain circuit boards or the entire unit to Aurum Acoustics in balmy Newfoundland. In my case, I sent a couple of the circuit boards from my Integris CDP to Derrick, and he returned them upgraded along with the phono stage and headphone amp. No white-glove treatment for Mr. Audio Reviewer. Installation, which included adding a new silk-screened portion of the back panel, took about 45 minutes. Even with all of these changes, the Integris CDP won't take on a Mk II suffix. "I feel that should only be the case if we make major non-backward-compatible changes," sez Derrick. "As long as we are able to very feasibly upgrade the existing units, the name stays the same."
. The Integris CDP presents music through the proverbial clear window -- without extra drama, which it leaves to the music." All of this remains true about the upgraded Integris CDP, but along with it comes greater density, a more corporeal sound that extends into the bass. Whereas the original circuit "wasn't capturing the gestalt of the bass on certain recordings" to the degree that competing units could, the upgraded Integris CDP has improved low-end weight and power, making this quality of the original circuit a non-issue now. I still admire the way the Integris CDP digs into recordings, exposing every detail and nuance in a free-flowing way. I've been listening recently to many interesting jazz recordings on the ECM label, and the Integris CDP conveys more about their unique sound -- which is very spacious and slightly dry -- than any other source I've heard. The instrumentation on Stefano Bollani's Piano Solo [ECM 1964] is just what its title suggests. The Integris CDP shows that while each note is clearly delineated, the sense of the piano as a self-contained instrument is not. The recording lacks some focus, which can happen with solo-piano recordings, perhaps due to the use of too many microphones for a single instrument. On the other hand, the Enrico Rava Quintet's The Words and The Days [ECM 1982] is a full-on spatial stunner thanks to the Integris CDP. I was skeptical about the new footer arrangement, because I was very happy with the Golden Sound ceramic cones that Derrick was selling along with the CDP. Those worked especially well with the nanoparticle shelves of the Silent Running Audio Craz Reference rack I use, increasing focus. The new cones and Counterpoints are at least as effective as the Golden Sound cones and Silent Running shelf, although they do add some extra height to the top-loading Integris CDP, which could be a problem if you have your unit on an internal shelf. Driving either Sennheiser HD 650 or AKG K701 headphones, the Integris CDP's headphone amp is like a direct line to the cochleae. The detail is striking -- you will hear things you haven't with speakers -- but the presentation is not analytical for its own sake. I suspect the headphone amp achieves this by being directly connected to a very resolving source, and then having its own low-noise circuit. While tube headphone amps may offer pleasing euphony, the Integris CDP's offers utter honesty, divulging what's on each CD -- or whatever source you've connected to one of the unit's inputs -- to a remarkable degree. I've heard quite a few headphone rigs, but the Integris CDP and its headphone amp are the best of them all. The new phono stage is also impressive, although all of the returns are not yet in, because I haven't been able to push its limits with a wide array of cartridges. However, like the headphone amp, the phono stage sounds true to what's upstream and adds practically no noise of its own. This last point is especially important for analog playback. 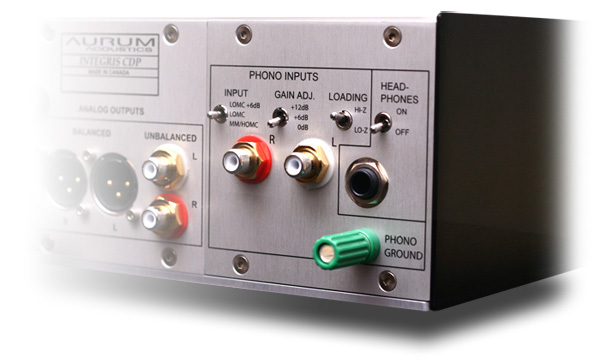 Any phono stage is dealing with minute signals, even from the highest-output cartridges, and the high gain required can ruin the sound if high noise comes along with it. It's obvious that Derrick understands this, because the CDP's phono stage is exceedingly quiet, as well as exceedingly low in coloration. More on the phono stage as I put time on it, especially with some low-output moving-coil cartridges. We in the press are so inundated with information on updates and upgrades made to speakers and electronics that it's easy to become jaded and overlook truly significant ones. There is no doubt that the upgrades made to Integris CDP have improved its sound, including its bass, which I questioned in my earlier review. Then there is the matter of the headphone amp and phono stage, both of which are sonically significant and greatly increase the Integris CDP's utility. I even had some nostalgic fun using them together. There I was, sprawled out on the floor and looking up at the ceiling, the headphones blocking out school and my parents, and a crackly copy of Steely Dan's Aja [ABC Records AB-1006] filling my head with adolescent memories of a girl named "Peg" (who, by this time in her life, surely loathes Becker and Fagen for writing that song). Back to the present, there is no other audio component like the Aurum Acoustics Integris CDP, whose wide-ranging features put it in a class of one, and whose sonic performance makes all of those features truly worthwhile. Take five, Derrick. All of your hard work has paid off. Price: $13,500 USD; $16,800 with headphone amp and phono stage.